Rajasthan BSTC Notification 2019 Apply Online Registration : The Government of Rajasthan and National Council for Teacher Education (NCTE) is going to organize the Basic School Training Certificate (BSTC) examination on 26th May 2019. All the candidates who are waiting to apply Rajasthan BSTC 2019 can start applying from 18th March at bstc2019.org. The last date to apply for Rajasthan BSTC is 10th April and the last date to pay the fee is 8th April. Interested aspirants can enroll quickly for Rajasthan BSTC within specified dates. Applicants must have the relevant educational qualification of 12th class/Plus 2/Intermediate from Rajasthan Board/ CBSE/ ICSE are eligible to apply for Rajasthan BSTC Examination. Interested and eligible aspirants can check more details such as Rajasthan BSTC 2019 Notification Download D.El.Ed. (Pre. B.S.T.C) Examination)–2019 Notification Online Application for राजस्थान बीएसटीसी 2019 Check Eligibility Criteria Apply Online Last Date and application process and other detailed information of Rajasthan BSTC examination from the article specified below. BSTC 2019 Online Registration: The Government of Rajasthan and National Council for Teacher Education (NCTE) is going to organize the Rajasthan Basic School Training Certificate (BSTC) examination this year. The examination is going to be held for aspirants seeking to become a teacher in the state of RAJASTHAN. Candidates qualifying this examination will get admission in Diploma in Elementary Education course. Candidates need to clear this examination with a good score to get the admission in various colleges. The Rajasthan BSTC examination is going to be conducted in the month of May. The NCTE has scheduled the Rajasthan BSTC examination on 26th May this year. Applicants must have the relevant educational qualification of 12th class/Plus 2/Intermediate from Rajasthan Board/ CBSE/ ICSE are eligible to apply for Rajasthan BSTC Examination. Students belong to the general category will have to get 50% of aggregate marks and SC/ST Candidates must have to get 45% of marks to apply for the Rajasthan BSTC examination. Students who are in the end semester of the qualifying examination can also apply for Rajasthan BSTC. Age limit of the applicants must not exceed 28 years as on 1st July 2019. Age relaxation will be offered for the reserved category candidates as per norms. Aspirants must require the valid email id, mobile number for communication purpose. Class 10th Marks sheet is required as it can be used the proof of date of birth of the applicant. Also, class 12th marks sheet is required for the purpose of verification of the qualification of the candidate. An Identity proof such as Aadhar Card, Voter Id Card, or any valid proof is required. Caste Certificate is also required to claim the category of the applicant. Scanned photograph, and signature of the applicant in preferred format. All the applicants who are applying for the BSTC examination in Rajasthan can check the exam pattern and syllabus details from here. Candidates applying for the BSTC exam will have to pay the requisite application fee as mentioned here. The fee can be paid through online. The Rajasthan BSTC online application form will be available on http://www.bstc2019.org/ from 18th March to 10th april 2019. By tapping on the application form, aspirants can apply for the BSTC examination. How to Apply Online for Rajasthan BSTC Exam Application Form? 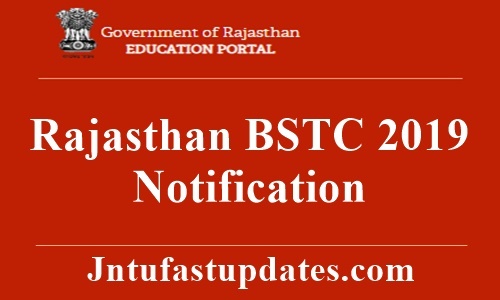 Go through the Rajasthan BSTC 2019 information bulletin 2019 clearly. Register with the site using the email id, phone number and other requited details and generate the unique enrolment number. Sign in with the generated enrolment number and log id id. Fill up BSTC Application form with required information. Finally, click on apply button. And take a printout of the application acknowledgement for further reference.